Fundraising with Breakthrough can take you to some amazing places. 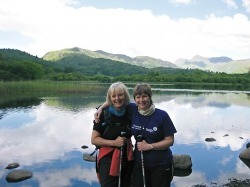 Discover some of the most beautiful and untouched landscapes in the UK, get fit and meet new people. Breakthrough Breast Cancer is a pioneering charity dedicated to the prevention, treatment and ultimate eradication of breast cancer. We fight on three fronts: research, campaigning and education. Our aim is to bring together the best minds and rally the support of all those whose lives have been, or may one day be, affected by the disease. The result will save lives and change futures – by removing the fear of breast cancer for good.